Steel - V-band Flange Machined for 3" Tube, Use 2 of these with the 3" V-Band Clamp for nice exhaust joint without the need for gasket. Also popular for use at all 3" turbine housing discharge. 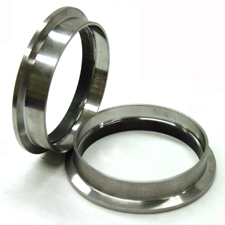 CNC machined from solid billet stock so this flange is very durable compared to most sheet metal/tubing rolled tubes.